Learning how to grow tomatoes is fun and easy. And most importantly, you needn't be a seasoned gardener to be successful at growing tomatoes. Even a tiny bit of gardening education is not a must in planting tomatoes. We'll supply everything you need to know to create confidence for your end result. Better yet, container tomato gardening is a great way to add some spice to your "cooking life." "I grew that in MY tomato garden." Have Great Tomato Growing Tips? On top of that, growing tomatoes at home means you know exactly WHERE and HOW that tomato was grown. No chemical or pesticide guesswork here! 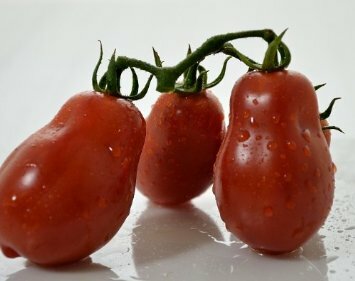 Whether you have ample garden space or are used to the unique conditions of container patio gardening... learning how to grow tomatoes in a container requires little time... yet yields many benefits. Simply said, there's no easier way to have home-grown tomatoes on your dinner table. Ready to find out what tomato varieties make great candidates for container vegetable gardening? Great! Let's get started! Use these links to jump from one step in the how to grow tomatoes series to the next. Sometimes, you will be taken to a new page on our website (when the topic is too long for this page), but simply keep following the tomato growing tips, step by step. We'll bring you back here for the next installment! 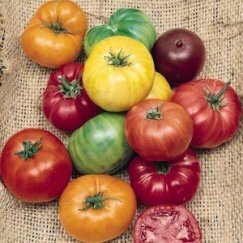 Our guide to the best tomato varieties for a container tomato garden includes pictures of the fruit, and links to places you can buy their seeds online. The first thing we need to do is locate the type of plant that will yield the tomato that we prefer. You may already have something in mind. That puts you one step ahead of the game. Do however, scout the healthiest plants as possible. Look for stems that are the diameter of a pencil. Look for ones that have four to six leaves and have no blossoms. Run away from the tomato plants that are yellowing and showing signs of disease. One important step in learning how to grow tomatoes is spotting a losing plant. Weed out the bad one before you invest time in nurturing and caring for it. 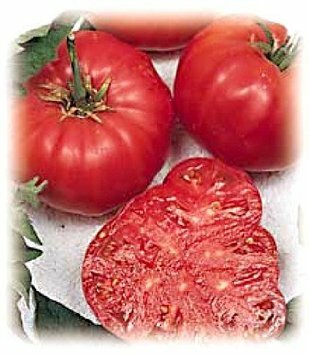 Hybrid tomatoes are bred to be disease tolerant, have less cracks, and do pretty well in a lot of different climates. Heirloom tomatoes (the opposite of hybrids) are selected for more taste. Though not as disease tolerant or climate friendly, they are preserved species, carefully protected from cross-breeding, and their seeds are kept from one season to the next. See our page on Heirloom Garden Seeds for more information. Next when growing tomato plants, we need to find something that is suitable for container gardening. Most traditional sized varieties will become too large for a container. The easiest way to hunt for just the right type we need, is to find the name, "dwarf" in the description. These varieties will be much more containable for our container purposes. The Patio Tomato (click to shop delicious varieties at Amazon) is specifically designed for this particular use. You'll see the plant producing tomatoes in about 70 days. The problem sometimes with planting tomatoes in containers, is that the plant gets too big for its britches. The Patio Tomato will host a stockier stem. Thus giving it the ability to "hold itself" upright much easier than a traditional tomato plant. The fruit the Patio Tomato produces will be smaller than the others, however the taste is just as wonderful. 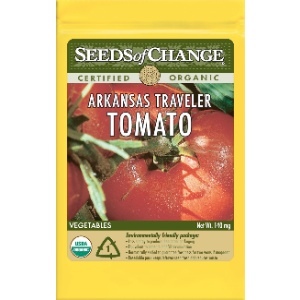 Click to get your seeds today, and start growing patio tomatoes! Cherry tomatoes, as you probably know, make great for salads and are delicious! 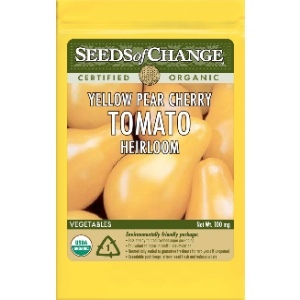 Click to find the best Cherry Tomato seeds at Amazon. However, they produce really long vines. That could be a problem if you didn't have the support required to hold these guys up. My suggestion. The grape tomato! Grape tomatoes are a really small cherry tomato. They'll host a much smaller vine than the regular cherry tomato. 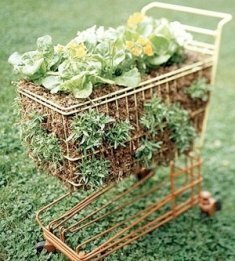 A winner for our container garden needs. 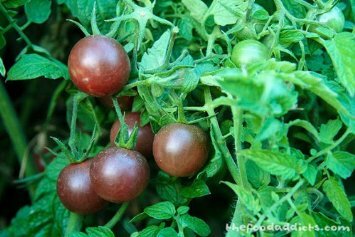 Click here to find awesome Cherry Tomato seeds today. The JetStar is an old favorite and will also produce fruit in about 70 days. A requirement, however, would be tomato cages or stakes that would keep the long wiry stem upright. In addition, a very large tomato container is a must. I would suggest something at least 5 gallons. If you do like a big, luscious fruit, you'll see it on this one. Sporting a low-acid tomato, you'll adore this guy melting away in your mouth. 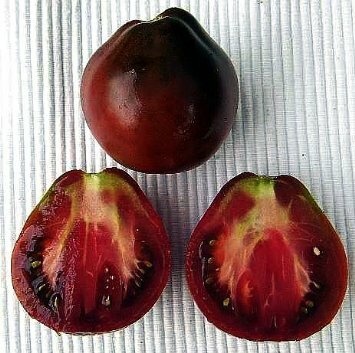 Click to get Jet Star Hybrid Tomato Seeds today from Amazon. A great all-around tomato plant! The Celebrity (click to find seeds at Amazon) one will bear fruit in about 70 days as the ones above. This variety has a decent sized vine that would suit a tomato container garden nicely. Get ready for a very, mouth watering and delicious taste. This guy will do excellent on sandwiches, salads, you name it! Staking or a tomato cage would also be a necessity on this variety. Click to get this year's supply of Celebrity tomato seeds. Roma tomato varieties sport a smaller vine as well. Again, with the addition of a tomato cage or support, the Roma tomato is very suitable for a large tomato container. Well known for a great tomato paste and other cooking avenues, such as salsa and chili, this one would make a win-win situation as well. 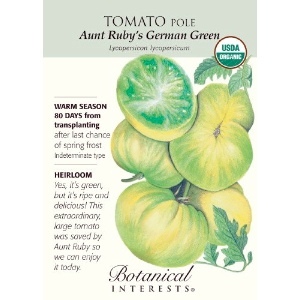 For more information on Roma Tomatoes, click here! You should be able to find any one of these at your local nursery, hardware store, etc. Though feel free to choose to your liking. Do however, scan the plant information tag for any specifics of how to grow tomatoes in your area. Any extra input can help you acquire a healthy plant and choose between the many tomato varieties available. Here are some more great choices for container tomatoes. Click on each one to read more, or order seeds (the links open in a new window on our website, so you can continue with the series). Choose wisely when picking your container for you new tomato plant. A mistake here could cost you a crop. Fortunately, we have plenty of great choices to make your how to grow tomatoes experience an easy one! 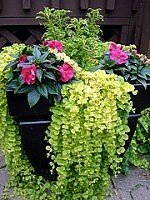 On the topics of choosing containers, you may have seen TV ads for the Topsy-Turvy Planter. It has a few drawbacks and a few perks you should know about when learning how to grow tomatoes. Read up on our reviews and tips to see if the upside down planter is for you. A great lightweight and porous potting material is Miracle Grow Potting Mix. I highly recommend it. It makes a great container potting mix for tomato plants. The #1 mistake container gardeners make when planting tomatoes is to reuse the same soil (or container) for their tomatoes from one year to the next. The soil becomes depleted of the nutrients your tomatoes need to flourish. For seasoned tomato growers using the ground, rather than containers, there is a "fix"; this involves planting a fast-growing Fall crop to re-energize the soil for next year's tomatoes. However, for our purposes, it's much easier to simply rotate your tomatoes from one container to another, or even dispose of the soil from your containers and replace it with fresh Miracle Grow before planting this year's crop of seedlings. Next on our how to grow tomatoes agenda is planting tomatoes we've picked out earlier. This syndrome is from the tomato plant being too long in the container. The plant's roots have grown to the point that they've started to rap around the pot in a horizontal fashion rather than the roots of the tomato growing naturally... vertically. If the root system has begun this process, you will need to free up the bound roots. Simply and lightly, pull the roots away from the bottom center of the plant. Do this on all four sides of the soil. Now that we have the tomato plant freed from its container, it's smooth sailin' from here. We now take our hand, or small gardening tool, and scoop to the sides enough soil from the center of the container to create a perfectly-sized hole into which the tomato plant will fit. The hole needs to be deep enough to allow for approximately half of the depth of the plant to be under the potting mix. The part of the stem that's under the potting mix will become part of the root, making the plant stronger and healthier for the long run. Next we simply place the root system into the hole. (Make sure it's plant-side up... just kidding!) Lightly pack the potting soil around the plant, and "Hey presto", we're finished. Lastly for planting tomatoes, we need to water the container and place in a suitable location. Now you are expert in another essential how to grow tomatoes step! Here, find the best way to keep your tomatoes watered the right way! 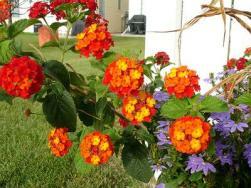 Too little water and your plants will wilt and shrivel, too much, and they will rot in the soil. Everybody learning how to grow tomatoes has made these mistakes in the past, so don't feel too bad if you do it. We have some very simple-to-use options for automated tomato plant watering, and manual methods for those of you who prefer to be control freaks in the garden... So let's go and read more! Once you have flourishing tomato plants, you will be horrified to discover that other things covet them too. Pests, blight, root rot, wilting... What's wrong with your tomato plant?! Learn the basic, yet highly important fundamentals of Tomato Plant Care during your how to grow tomatoes journey. Find ways to identify potential Tomato Problems and Tomato Diseases, and learn how to cure them. If you have great advice on how to grow tomatoes, then please don't keep it to yourself! Share your ideas and discoveries with other readers, and make us all better container gardeners. Simply click here to leave a comment with your idea or tip on how to grow tomatoes better. Other tomato fans will thank you for your generosity. 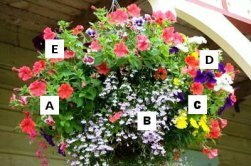 Looking for some Container Gardening Tips? Click Here!